I Love all cute things! 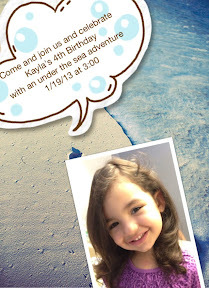 : Getting ready for an undersea Birthday party! Getting ready for an undersea Birthday party! I hope you guys are having an awesome day. Today I am getting things ready for my daughters 4th Birthday party. I am very thankful for blogs. 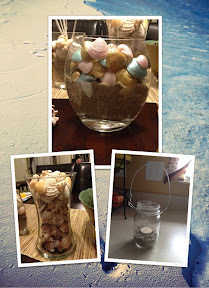 I was able to use so many ideas from the blogs I read. I will be posting links of the blogs that I used, and pictures of how everything turned out. I will also try to say where I bought the things that I used for the party. I will also update this post with new pictures once everything is in its place on Saturday! First I would like to show you my last minute invitation idea! Using an app called Photo wonder. When I was searching for ideas for the party I found this blog. 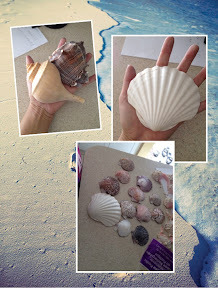 In her blog she posted pictures of shells that she used for decoration, and she also had her guess paint some as well. Witch I thought was a great activity for the little ones to do. I was able to find this awesome bag of big shells at Michael's for 12.99, but I had a coupon for 40% off. 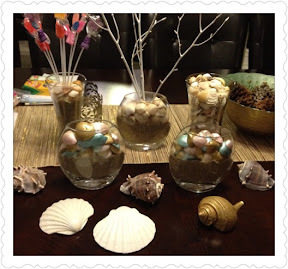 I need more shells and sand for some decorative pieces, so I went with the girls and they had a great time.